“Acoustic, Rockabilly, Country, Blues, Cowboy, Old-time music, infernal jangling, yodeling and toot-a-looting” is how The Dirt Daubers describe their music. Their newest release on Colonel Knowledge Records, Wake Up, Sinners, is an “eclectic mix of Appalachian, ragtime, and hot jazz standards and original music.” Band members J.D. 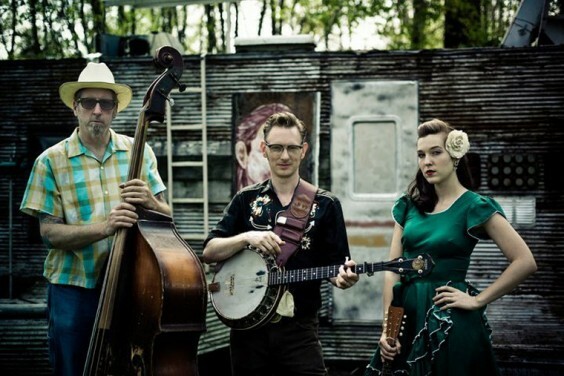 Wilkes (banjo), Jessica Wilkes (mandolin), and Mark Robertson (bass) hail from Paducah, Kentucky, and Nashville, Tennessee. Citing influences such as Tom Waits, Wanda Jackson, Ralph Stanley, Dock Boggs, and Cab Calloway, The Dirt Daubers are a band to behold. This title track video was directed by Joshua Black Wilkins. Read an interview with The Dirt Daubers. . .
Read more about The Dirt Daubers here and here. . .